If you’re looking for an efficient way to get to explore Colombia, let us set you up for success. We offer a wide range of vehicles to cover different group sizes. 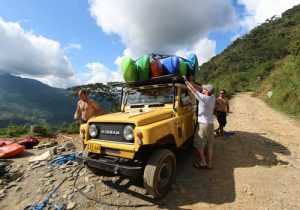 Traveling around Colombia with kayaks can be quite the mission! Our professional drivers are ready to take you straight to the put in and meet you at the take out with some cold drinks, so you can just enjoy kayaking on Colombia’s incredible rivers. We are used to organize biking, trekking and paragliding trips. If you are coming to Colombia with a big group, your best bet is to rent one of our vans and enjoy private transport with shared cost! Our knowledgeable drive will meet you wherever you are in Colombia and be at your service 24/7. If you are traveling internationally, we recommend you fly into Bogota or Medellin, where flights are least expensive and most frequent. If your flight arrives to Bogota, our driver will receive you at Bogota’s El Dorado International Airport airport. If you flight arrives to Medellin, you’ll be received at Medellin’s José María Córdoba International Airport. From here, our professional driver will take you where and when you need to go. The expert kayak and raft guides at Expedition Colombia, with headquarters in Medellin, will be in constant communication to help you answer any questions you may have. Your trip can range from one day to one month in length. We can also arrange a longer trip if you need. Your driver is available 24/7! Depending on the vehicle and the duration of the rental, price range from 70 USD / Day to 160 USD / Day.